Assignment 53 is a platform game with a retro twist to it! 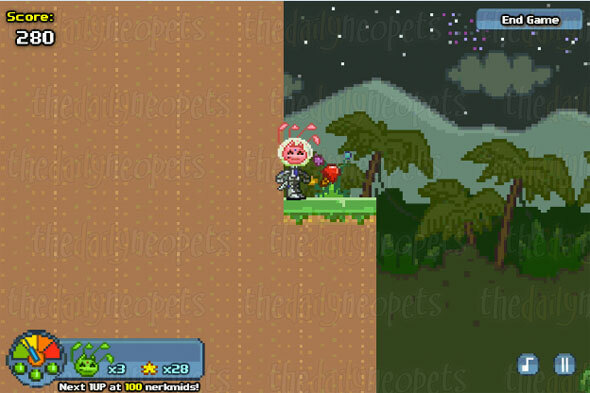 It's the first Neopets game that looks and feels like one of the early video games such as Super Mario Bros and Sonic. You can either play as Eddix (male) or Moxi (female) and your mission is to explore dangerous planets to retrieve stranded scientists. Failure is not acceptable as the Invasion Force needs this assignment to be completed as soon as possible! You direct Eddix or Moxi using arrow keys or the WASD keys. If you need to crouch down, press your down arrow key or S key. Jumping is done by pressing your up arrow key or W key. There is one known cheat code for this game. Press the following arrow keys when on the 'Start Game and Instructions' page to gain one extra life: up up down down left right left right. You should hear a buzzing sound that indicates that the combo has been registered. First, a few notes about the user interface. 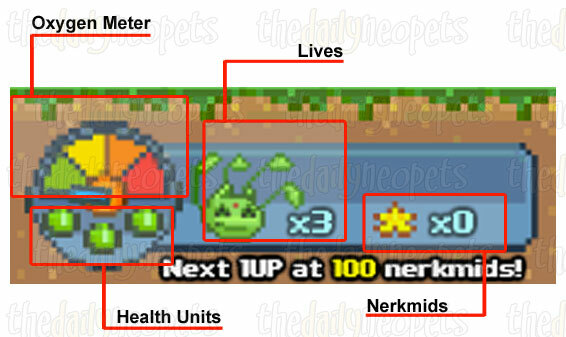 In the lower left corner of the game, you might have noticed that colorful area that is composed of a meter, three dots, and information regarding the amount of lives and Nerkmids you have. The meter that goes from green to red represents your oxygen level. When you run out of oxygen, you lose a life. Directly below the meter you have 3 lights that represent your health units. Every time you take damage from foes, one of the lights turns red. Three red lights means you lose a life and restart at your last saving point. Throughout the game, there are a lot of Nerkmids to collect. If you die in the middle of a level, you won't keep the Nerkmids you earned after the last saving point; you have to collect them again. However, for each hundred Nerkmids collected, you gain one life. The next milestone that awards you a life is always written below the user interface. For instance, if you had just collected your 500th nerkmid and then accidentally fell in a pit, when you restart the level, you might see Next 1up at 600 Nerkmids because you were already awarded a life for collecting 500. You can collect power ups, food items, and Nerkmids throughout the game. The power ups can stack on each other and last until you lose a health unit or lose a life. Gravity boots: This power up lets you jump higher. Force field: This power up protects you against enemies and kills all hostile creatures, even the ones that would normally be indestructible. The force field power up protects you for 14 seconds. Energy wings: This power up allows you to move faster. It can be very handy when you need to do long jumps or to save some oxygen. The energy wings power up also lasts for 14 seconds. Gross food items will restore your health unit by one. However, if your health is perfect, you will receive 100 points instead! Each Nerkmid is worth 10 points and is added to your score at the end of each act. Besides that, you earn a bonus at the end of each act based on the quantity of oxygen you have left. You also get 30 points every time you kill an enemy. Speaking of hostiles creatures, here is a list of the ones you will encounter during the game as well as a description of how they behave. Walks left to right ; not very dangerous. Fires one ammo every 6 seconds in the shape of a circle's arc. Fires three ammos every 6 seconds following the path of a W shape. Rolls left to right ; not very dangerous. Does not move. If you touch it, you lose one health unit unless you have a force field power up. 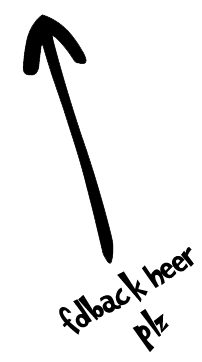 Walks left to right and fires one arrow every 6 seconds following the arc of a circle. Fires three ammos every 6 seconds following a W shape. Fires one ammo every 6 seconds following the arc of circle. Fires five ammos every 6 seconds in a \W/ shape. Fires one ammo in a straight line pattern. From the starting point, move right and jump on the hill to collect all the Nerkmids. Keep going right, jump on the lizards and the flower. Wait for the lift to come within your reach before jumping on. When it reaches its highest point, jump left and collect the force field power up. Go right and jump to save as much oxygen as you can. Collect the food item and walk over the saving point. Go down, kill all the enemies and collect all the Nerkmids. Squash the flower that is on the edge and then run right to the end of the level. From the starting point, go right and jump on the lift. Collect all the Nerkmids and be careful to avoid the ammo that the flower is shooting at you (press your down arrow key.) Squash both flowers, then go up using the lift. Jump on the two orange guys, collect the energy wings power up and all the Nerkmids. You can also jump on the top flower and squash it. Go right and walk over the saving point. Jump on the lifts and collect all the Nerkmids. Jump on the ledge and wait until you see the lift and jump on it. Collect the last few Nerkmids, squash both lizards, and save the first scientist. From the starting point, go right. You will notice many ledges with blue octopi firing ammo at you. Approach them carefully. Collect all the nerkmids and squash all octopi as you go up. Collect the food item and squash the rolling ball up there as well. Go down and walk over the saving point. Be careful not to touch any of the pink tentacules, but you can kill all the green guys. Go down, then left. Jump over the tentacles, kill the red guy when it's not shooting. Go right and up. 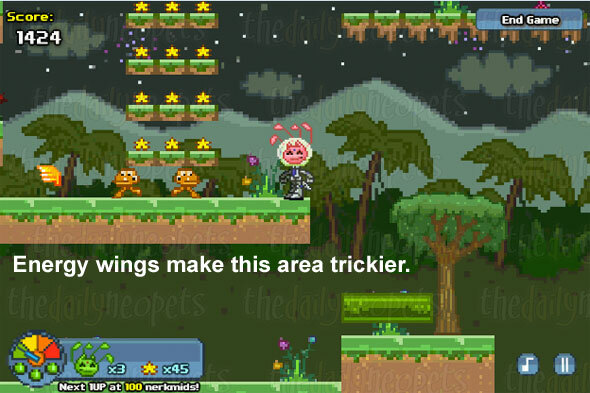 Collect the energy wings and run to the end of the level while collecting Nerkmids and squashing all enemies. From the starting point, go right and jump on the pink lift. 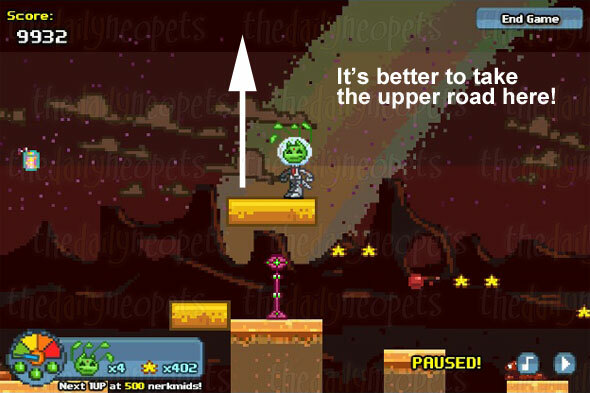 Keep going right, collect the force field power up, and jump on the upper lift then immediately on the middle lift. Collect all the Nerkmids that are in your reach, then jump on the lower lift and collect these Nerkmids. By the time you are done, your force field should have worn off. Jump on the ledges and squash the red guy. Go down and jump on both balls. Collect all the Nerkmids. After you have collected everything, go to your left, take the lift that moves left, and get off on the ledge with the purple tree on the other side. There will be an alien there. Don't crush him when you jump on the lift. Instead, wait until he gets close to the left wall, and jump on him to use him as a height boost while moving left to enter a secret area with 12 Nerkmids. You can also enter the secret area by famming down the ledges at the starting point instead of taking the lift, but you'd miss other items, so it's better to do it a little later. Once you have collected them, go back right the way you came. Wait for the lift that goes right. Jump on the blue octopus and go up. Wait for the lift and collect the food item. Walk over the saving point and keep going right, then down and left. 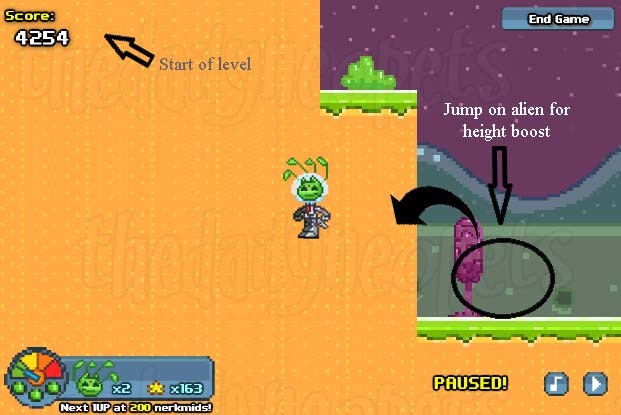 When you have collected the gravity boots power up, back track and use it to push yourself between the 2 hills. There is a food item over there, so make sure to collect it before going down and continuing your journey. Go right until you see 3 red shooting monsters. Wait for them all to fire their ammo, jump over them, and you can easily squash them in a right-to-left order. 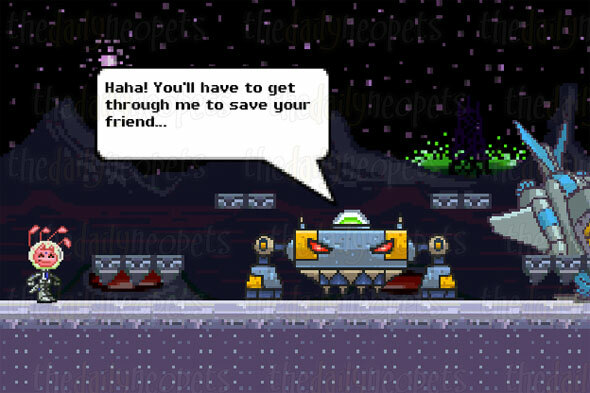 Walk to the end of the level and save the second scientist. Go right and wait for the lift to be within your reach. Jump on the red monster, collect the Nerkmids and the gravity boots. There are Nerkmids above that you can collect by pushing yourself on the wall. When you have collected them all, go right and gently let yourself fall into the pit to collect the force field power up and the Nerkmids. Jump between the two hills, using the wall to push yourself and collect the row of Nerkmids up there. Go down while still being surrounded by the force field and kill all the monsters. The next part is tricky. Your objective is to go up without losing a health unit. The gravity boots power might help you get there faster. You can kill all the enemies there if you feel comfortable, too. 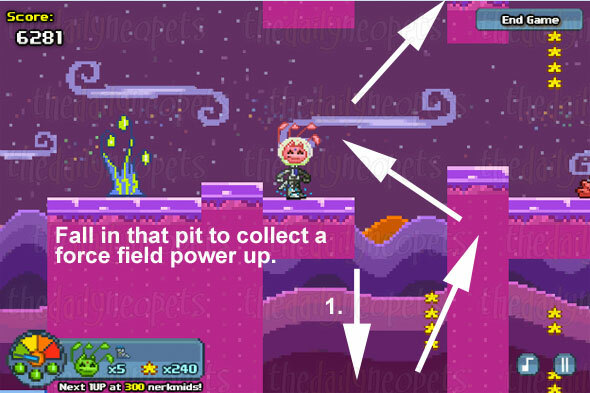 Collect the Nerkmids and the food item and keep going right until you walk on the saving point and reach a pit. 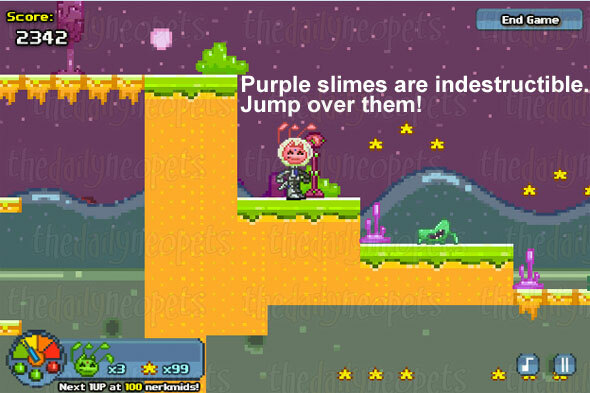 Jump to the next ledge and kill the bubble monsters, pick up the energy wings, and collect the Nerkmids. It's not easy to collect every single Nerkmid here, so just do your best. Go down and jump to the left, collecting Nerkmids and dealing with all the red monsters as you move. Go down and right, doing the same thing. Then you can use the lifts at the bottom to collect the remaining Nerkmids and head right. Be careful, because there is one yellow monster shooting arrows at the end of the lift area (press your down arrow key to avoid the projectile.) Kill the yellow monster and complete the stage. Go right and kill all the monsters while collecting the Nerkmids. Go down using the lifts and collect the Nerkmids there. Be careful not to fall in the pit! Go right and rescue the third scientist. Go up using the lift. Go right and collect all the Nerkmids, jump on the lift that goes down and collect the force field power up. You can now safely kill the 2 spiky monsters that are down there. Wait for the lift to come back down and jump on it or backtrack to the beginning of the level and use the lift that was there. Go right and collect the energy wings. You are likely still protected by the force field power up so run down that area and collect all the Nerkmids. When you are done, take the lift that goes back up and walk over the saving point. I highly recommend that you wait for the lift and go up, as many Nerkmids are hidden there! For some odd reason, the timing is not always good. If it is not good timing for you, go down and collect the gravity shoes power up. You will be able to jump between the walls to go up and collect all the Nerkmids. If that's the road you have chosen, keep going left until you see another row of Nerkmids. Then go back right and walk over the saving point. There is another gravity shoes power up that you can collect there. Go right and be careful because red monsters are firing their projectiles at you. This area is not too bad to master if you have the gravity shoes. It's safer to kill both monsters and collect the Nerkmids after. Go right and finish the level. From the starting point, go right. Collect the Nerkmids and kill the monsters. Keep walking until you reach a wide pit. Be sure to be on the very edge of it when you jump or you will end up missing the next piece of land. Jump on the lift and kill the rolling monster at the top. Then wait for the lift that goes horizontally and jump on it. Go left and collect the Nerkmids, then go back right and wait for the brown monster to shoot before moving further. Then jump on the monster and collect the Nerkmids. Keep going down and kill the red monster on your left. Go right and kill the brown monster. 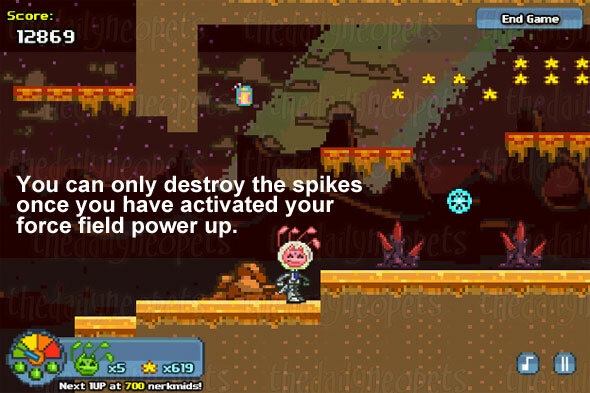 Then jump over the spiky purple monster and collect the force field power up. Once activated, you can run over the purple guys. Go up and collect the Nerkmids as well as the food item. Go right and jump on the lift. Kill both monsters and collect the Nerkmids. Walk over the saving point and then be careful while going up. Go left and jump on the thicker lifts to collect all the Nerkmids that are there. Go right and be cautious around the monsters. Collect all the Nerkmids and save the fourth scientist. From the starting point, go right and take the lift to go up. Collect the Nerkmids and the food item. Then go right and down to pick up the force field power up. Kill the monsters and take the lifts to progress in the level. 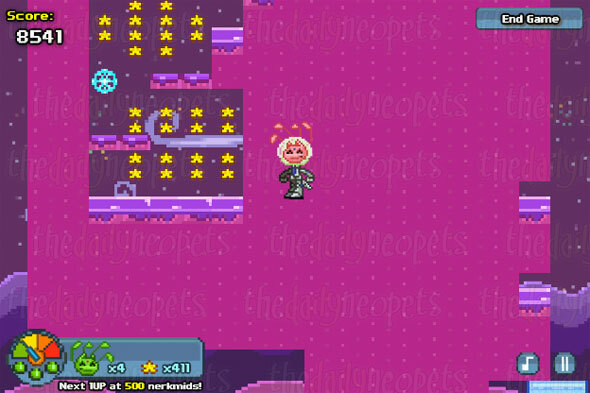 At the very top, there is a nice area with many Nerkmids, a gravity boots power up, and food items. Make sure to collect everything! Keep going right and collect the Nerkmids. There are many monsters to kill as well, just be careful not to get hit by them. There is another saving point around there. 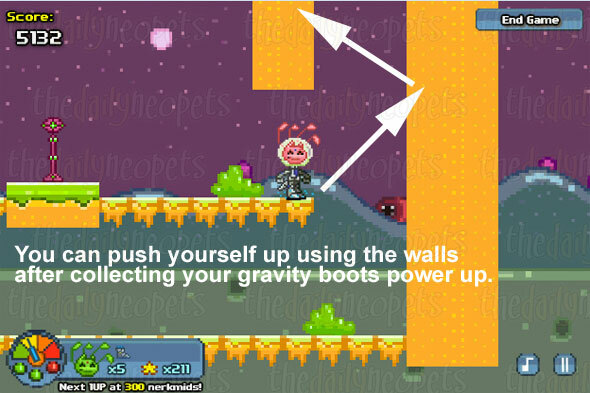 If you lose your gravity boots power up, you can use the many lifts to collect everything. When the area is cleared, walk to the end of the level. From the starting point, go right. Collect the Nerkmids and kill all the monsters. When you get to the place where it goes down, be careful: you want to go up! Collect the gravity boots and go further up. There is a very nice area at the top of the level where you can collect many Nerkmids and two food items. 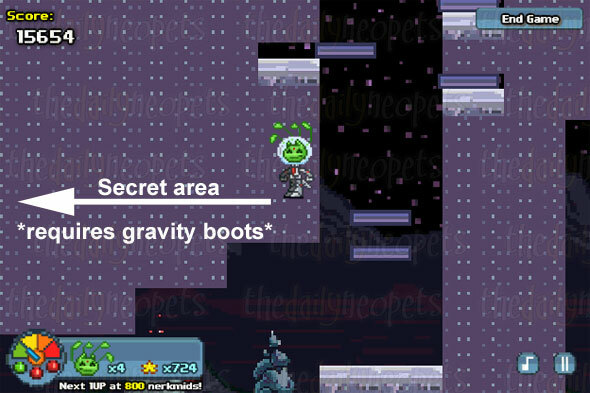 If you get hit at any point, it's good to know that there are two extra pairs of gravity boots that you can get. Once you have collected everything, go down and walk over the saving point. Squash all the walking monsters and collect the food item. Then go down and collect all the Nerkmids. Keep going right and collect the energy wings. If you were not able to get inside the secret area, take the lifts to go up and walk to the end of the level. In order to rescue the last scientist, you need to defeat this boss. Don't worry, he is not very tough. You damage this robot by jumping on its head when the light is green. Right after the dialogue, you should be able to hit him 3 times. 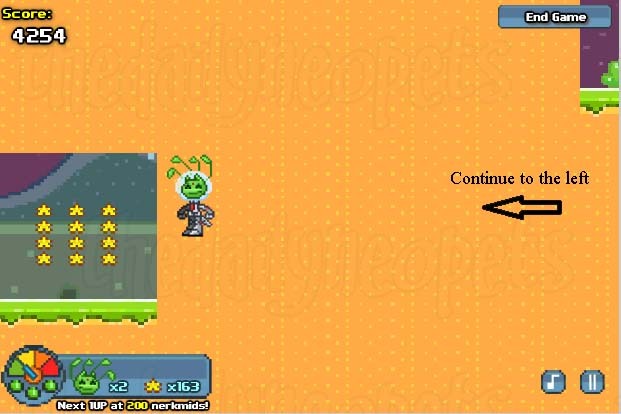 Then run to the lower right corner and press your down arrow key while he is firing at you. After he has done his thing, jump on his head 3 more times and go hide again. You need to hit it on the head 10 times to defeat him. Assignment 53 is surely a refreshing game that connects us with games from another time. 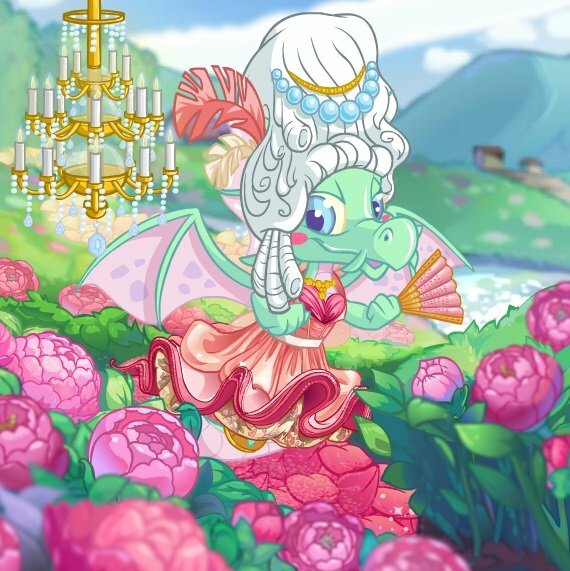 If you enjoyed it, you might want to look into the "Hannah" flash game series on Neopets, which works on the same principles. For now, hurry up, recruit! You have scientists to retrieve for your commander!